It’s no secret that I kind of have a thing for IKEA. 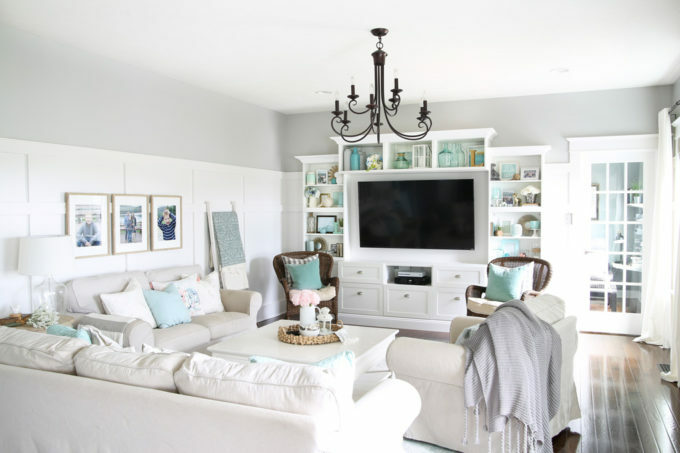 Their stuff is affordable, cute, and incredibly well thought out, and over the years I seem to have collected IKEA pieces in just about every room of our house! 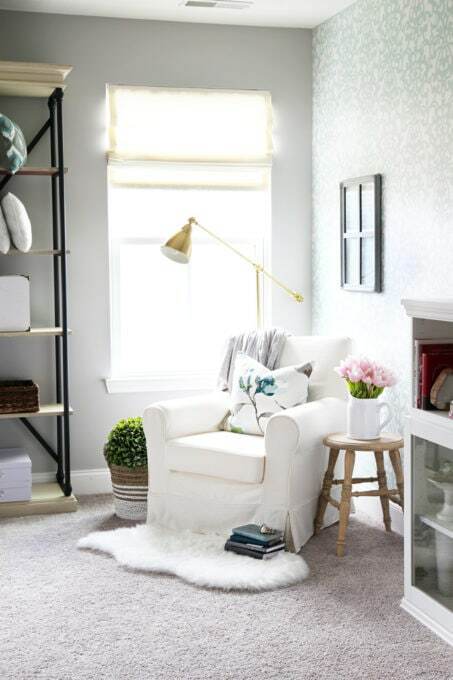 There are several things that IKEA does especially well, and one of those is to create great decorating staples that are easy to layer, build upon, and work into many different types of spaces. 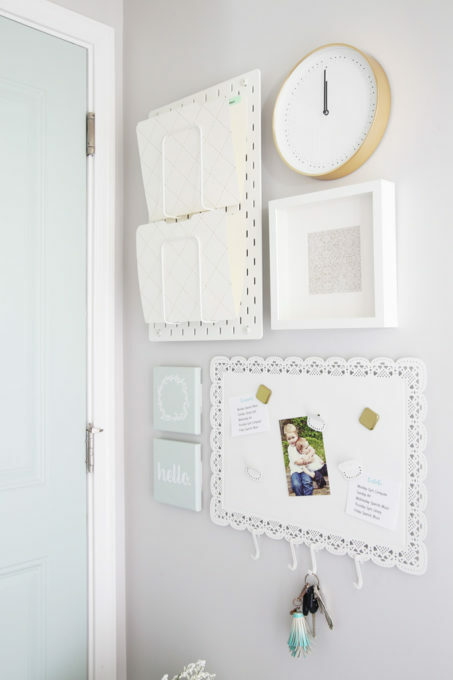 Since I already made a list of my favorite organizing items from IKEA, I thought it might be helpful to make a list of my favorite decorating staples as well! These are all items that we own and use often, and have been a huge help in creating the cozy, welcoming spaces we envisioned in our house. I am cold all the time, so even in the summer, I am always curled up under a blanket! I keep throws draped over our couches and peeking out of baskets in any room where I spend a significant amount of time. I have a few of IKEA’s GURLI blankets, and this cute blush INGABRITTA throw is on my list to snag the next time I’m at the store. 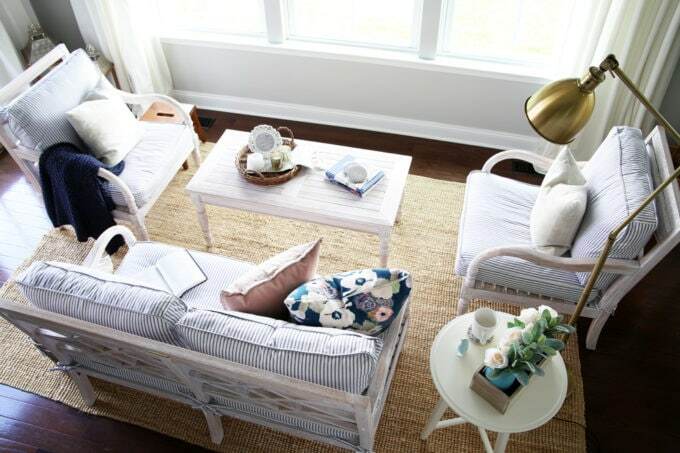 We have moved these cute white nesting tables all around our house, and I’m tempted to get a second set! They are nice and neutral and come in two sizes, so whether we need a surface next to an armchair or need to tuck one away in a corner, the KRAGSTA side tables work beautifully. 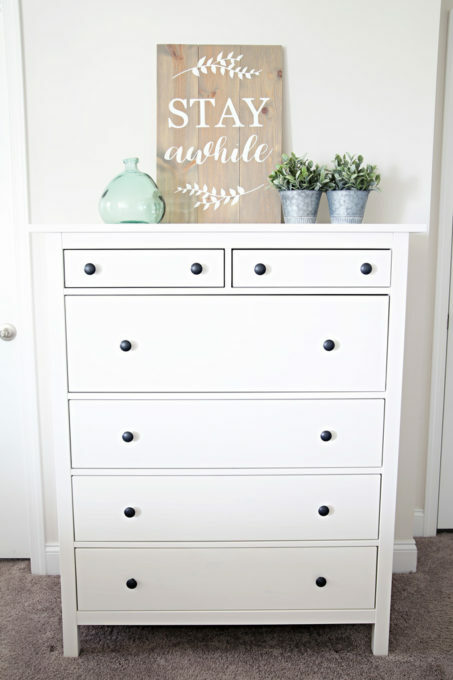 The HEMNES dresser is one of my more recent IKEA acquisitions, and I’m already loving it! 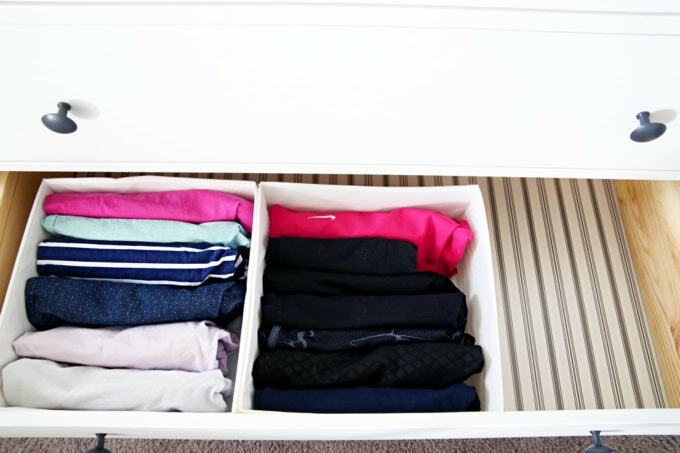 There is so much storage space, and the drawers come already prepped with cute liners. 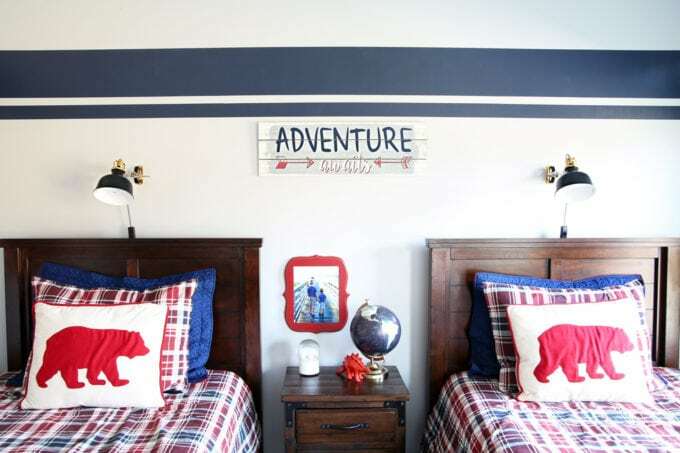 It is one of the more extensive pieces to put together because it has a bunch of parts, but we loved the look of it so much that we put one in our bedroom and one in our guest room as well. I searched far and wide for wall lamp for our boys’ shared room, and of course the RANARP lamps ended up being perfect. …and to complete my IKEA lamp obsession, I snagged the brass BAROMETER lamp for my office, and it is perfect for my little reading corner. 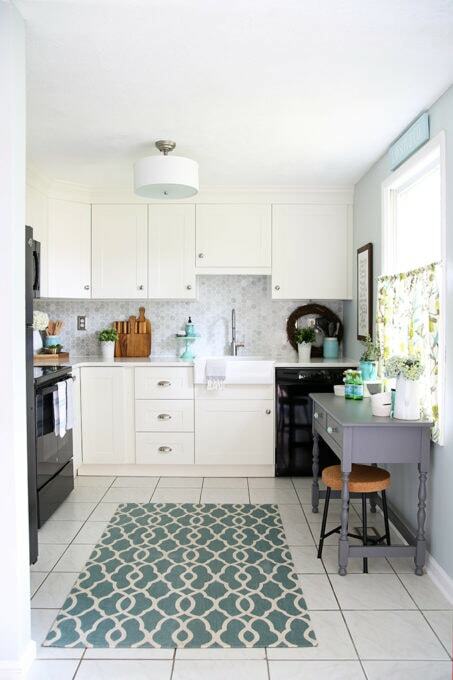 I love neutral rugs because they can work well in many different spaces… which is especially wonderful if you change your decor around a lot like I do! (Oops!) The LOHALS and OSTED rugs are great base pieces, and they would work well for layering as well. 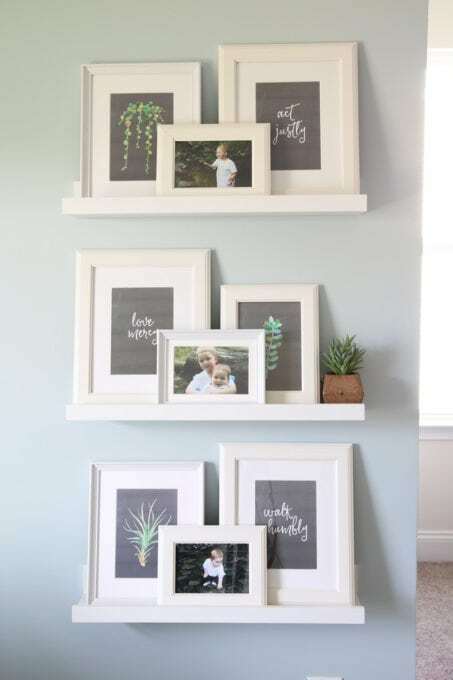 I use frames everywhere in our house, from the walls to the surfaces to floating shelves. Frames at the craft store seem to get pricey pretty quick, so I love that IKEA has a bunch of basic inexpensive options. I tend to find myself gravitating toward the RIBBA and VIRSERUM series most often. 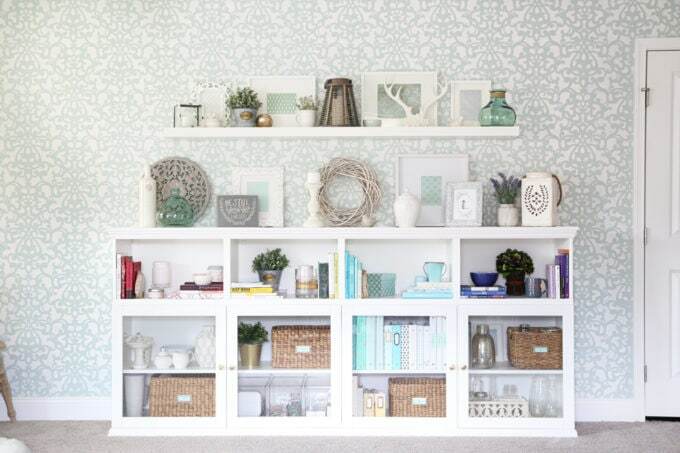 And speaking of floating shelves… Shelves are probably my most favorite way to fill a wall because I can switch out the decor easily for each season. I use the MOSSLANDA picture ledges in my office nook (above) and a LACK floating shelf on my stenciled office wall. Finally, my most favorite decor staple at IKEA is their EKTORP line of sofas and chairs! I love that I can have multiple covers for each one so I can easily change up the look of my space. They are durable and kid friendly too– I can throw the covers in the wash if they get spilled on or smudged. …and I have the smaller JENNYLUND chair in my office as well. Before I head out, I wanted to mention one more IKEA decor item that we loved and that made a huge difference in our home: the SEKTION kitchen! I wouldn’t necessarily call IKEA kitchens a “staple,” but if you’re looking to do a kitchen renovation on a budget, I highly recommend them. We completely gutted the kitchen in our former townhouse and installed an IKEA kitchen ourselves (and by “ourselves,” I mean that Donnie did nearly all of it because he is amazing 😉 ), and it truly helped us make use of every single inch in our small space. You can read about the installation process here, see a full reveal in this post, and find out the things I miss about not having an IKEA kitchen anymore in this post. 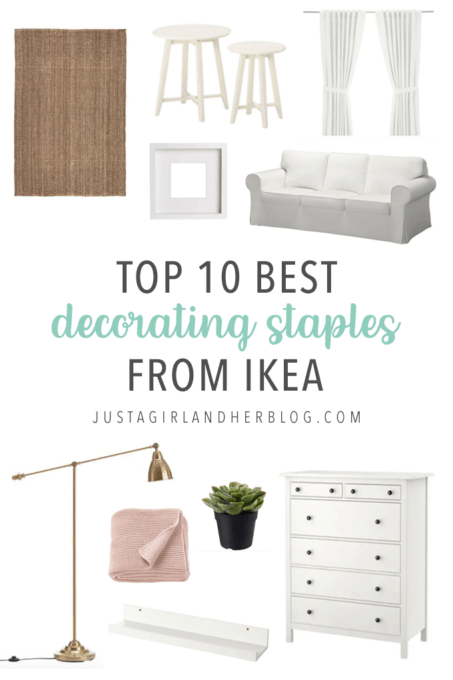 I know this list doesn’t touch on all of the awesome decor staples that IKEA carries, so let me know what you would add in the comments below! Your home is lovely. It is decorated so cute! I love Ikea as well. My husband has spend several weekends this summer putting Ikea furniture together. He is getting really good at it but did say that he needed a break from it! Oh yes, the IKEA furniture can be a bit much after building multiple things! 🙂 Thanks so much, Bonnie! Have a wonderful week! I wanted to buy some furniture from Ikea but will told that furniture from Ikea is not the best quality. Do you agree or disagree. I would like to know because I want to buy a bed form them. Hi, Wanda! I love IKEA and keep buying it because it has worked well for us! 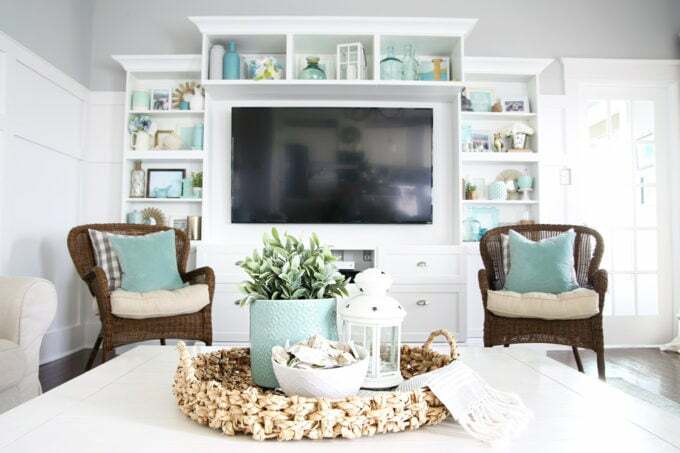 They often have items at different price points, which will hold up in different ways. For example, their $10 LACK side table is a lot more basic than their $100 HEMNES side table. But the LACK table would be perfect for a college student on a budget who just needs a place to set their stuff. So you just have to weigh what you’ll be using the item for and if it is designed to hold up to the amount of use it will get in that spot. We have been thrilled with our furniture pieces we’ve purchased from IKEA like our couch and love seat, BESTA built ins, PAX storage, and HEMNES dressers. They have all held up well for us and we have two crazy little boys running around that are not exactly easy on furniture. 🙂 I hope this helps! We have IKEA furniture that’s lasted 20+years! Go ahead…buy it…you won’t regret it!! 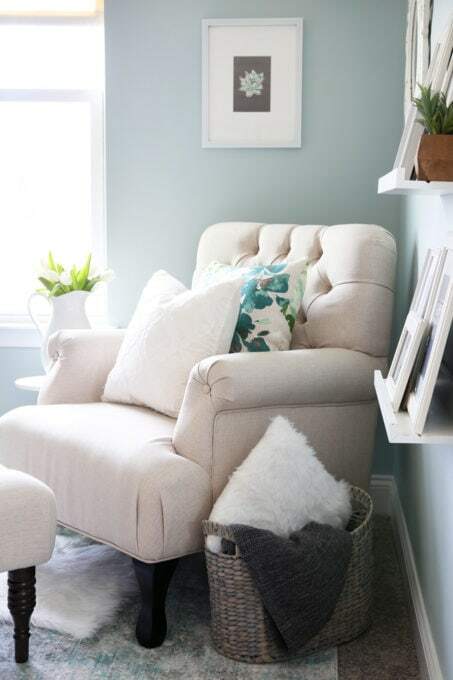 Great list – I was wondering how you wash your Ektorp sofa cushions and keep them so clean. Mine seem to get dingy very quickly and even when I wash them they still look darker than brand new ones. Do you use Oxi Clean? I usually use OxiClean when I wash them! The white ones can be bleached. (I’ve never had to bleach mine, but I have friends who have, and they’ve said it worked well for them.) If there is a spot on them, I will pre treat it before I put it in with the OxiClean spray. Other than that, I haven’t really done anything special– I just wash them with the All free and clear detergent in warm water. IKEA really is the best, isn’t it? 🙂 Hope you’re having a wonderful week, Alina! Love all of these options! Your home is so lovely! 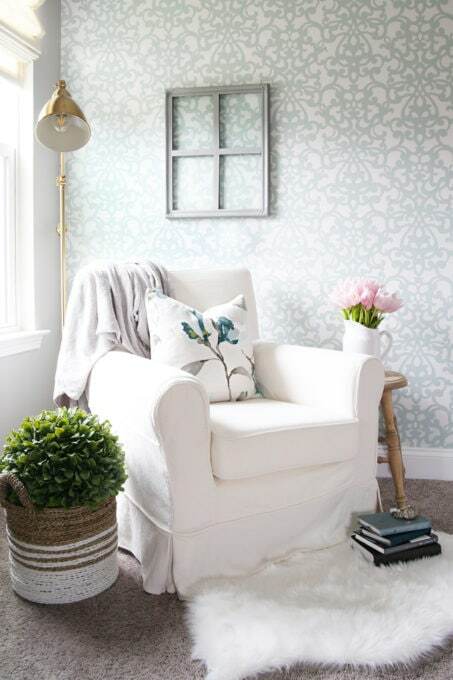 Where are the prints from in your office nook frames? We moved into our house about 2 and a half years ago and it is right around the corner from an IKEA. Like a 2 min drive (not kidding). The first year we were probably there at least once a week. Haha. I am looking around our house right now and I don’t think we have a single room where there isn’t something bought in IKEA. I love them. But bottom line, I LOVE IKEA too. And I love reading about your excitement about them. I LOVE Ikea! We don’t have one where we live anymore and man do i miss it! You did a great job decorating btw! IKEA really is the best, isn’t it? 🙂 Thanks for stopping by, Dana! Have a great week! Thanks for the staples, Abby! I need to remember to always check IKEA for rugs, throws, and pillows! Yes! Always worth checking! 🙂 Hope you’re having a great week, Julie!